We called it Der Edelkampfwagen, literally translated as the Precious War Wagon, or more fittingly, and just as correct, The Precious Struggle Wagon. 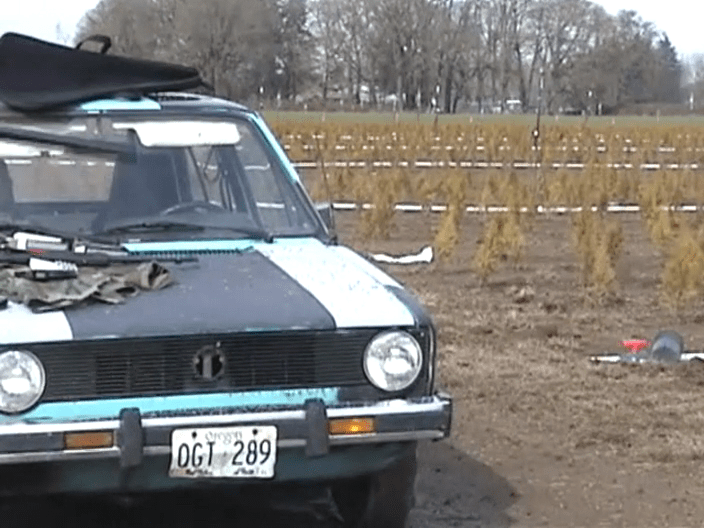 It started out as a baby blue 1981 Volkswagen Rabbit with an automatic transmission and no frills. It ended up as a piece of crap Der Edelkampfwagen. I don’t remember how or where I got it, so there must not be a good story there. I can assure you however, that even though I don’t remember buying it, it was super cheap. Because I am super cheap and there is no way I would pay much for a baby blue VW Rabbit with an automatic! I had taken up working (sort of) for a living and had a normal (sort of) job. I was working for a local security company and the Rabbit became my economy transportation to and from different job sites. It was the typical inglorious piece of German engineering from the era, the taillights worked but some of the time, the radio never worked, and small parts occasionally took an early retirement. But of course because it was a Rabbit it unfortunately kept on going in one fashion or another. Though it started out baby blue, it didn’t stay that way. After my friend Peter was through with the Travelall he needed another car. So I sold him the miserably slow little Rabbit. During this time I convinced him that it was quite boring as it was and that since it had little intrinsic value, it was a good candidate for doing something interesting with. Peter wanted to paint it camouflage but I thought that we should keep some of the original paint to save money. But what kind of camouflage has blue in it? 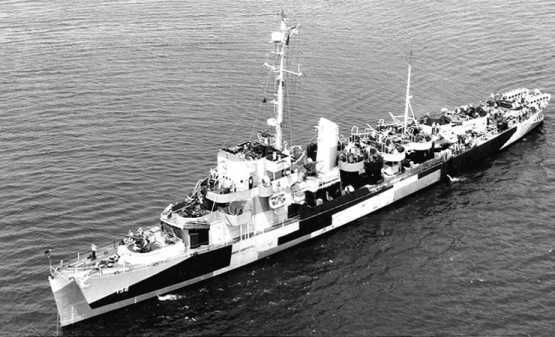 One day I was looking at some pictures from WWII and noticed a German Ship painted in disruptive camouflage. Ha hah, I thought, that’s the ticket! So using cardboard masking we painted it in a German battleship disruptive camouflage pattern. Since I was not the one driving it, that was not enough for me. It was lacking a certain je ne sais quois. So looking at old German WWII vehicles I noticed that all of the “Kampfwagons” had the spare tire on the hood. So we mounted the spare tire to the hood, now it was perfect. 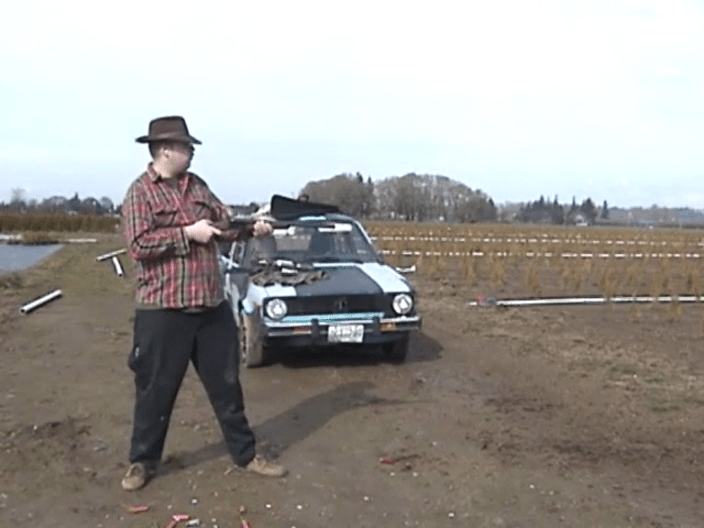 Peter drove it unashamedly like that for quite some time until I got transferred to an armed position in Portland. At that time I needed a commuter car and I bought it back from Peter. I had not really figured on having to drive it like that myself. But I was poor and Peter really wanted a gun I had so it was a trade of convenience. It came to pass that I was away and Michelle was driving Der Edelkampfwagen when the entire exhaust system from the collector back, fell off. As the sheriffs in our area were quite aggressive it was necessary to replace it right away. So she bought a new exhaust system from my friend at the VW Shop. Since I was gone it fell to her to install it as well. And install it she did. It may have taken her several hours, but it did indeed get installed. I should mention here that if there is anything she hates more, it’s working on cars. As far as dependability, I can’t say it never let me down, after all it was a Rabbit. Many times the taillights were found not working and often various other electrical components failed to perform. On one occasion the temperature was very cold out side for our moderate state. It was late and I was leaving my friend’s house when I was pulled over. Of course the taillights were not working again. The policeman insisted I park the car and not drive it until they were fixed. So I ended up walking back in a T-shirt in thirty degree weather, I cursed Rabbits once again and decided that I would get rid of it at all costs. And then it happened, the day I had prayed for, no it didn’t blow up, I found a better car for cheap. I made Peter an offer he couldn’t refuse on buying back the Rabbit and I got an Audi we will talk about latter. Peter loved Der Edelkampfwagen and I was glad that at least someone did. But if there was one thing he was no good at, at all, it was working on cars. It began leaking oil from the valve cover, I refused to work on the car ever again. So Peter enlisted the help of Michelle and together they attempted to change the valve cover gasket. The result of which was the engine catching on fire and Peter putting it out with a wet shirt. It seems a myriad of small mistakes had led to disaster which of course I was obliged to fix. So a new valve cover gasket, some new wiring and hoses, and it was back on the road. Somehow, I don’t remember how now, I ended up owning Der Edelkampfwagen again! I couldn’t get rid of it! So I drove it until the taillights stopped working again and one of the CV joints was making crunching sounds. And then I found a perfect couple to buy it. They were living in their van and needed a fixer upper car. When they saw it, they fell in love (it takes all kinds, doesn’t it)? So I was finally rid of it and three hundred and fifty dollars richer, which was not really justifiable compensation for the damages it had done to my psyche. For some time afterward I kept expecting a call, or expecting the new owners to come driving up and give me back the Rabbit, or to want me to fix something on it. Eventually the PTSD of owning it wore off with time, but I swore I would never own another Rabbit………. Wow man, you ditched a Rabbit for an Audi? At least the Rabbit wouldn’t stop running. You Sir have had more interesting times in your POS cars than most wealthy individuals will have in exotic cars. I mean that as a compliment. “Escaping” the VW by getting an Audi — talk about going from the fat to the fire! My father and mother were lifelong fans of Volkswagen until they bought their first new one, which happened to be a 1980 Rabbit 4 door in baby blue, just like the one in your story. Ours was a 4 speed. They never bought one (or even considered it) ever again. Between missing head bolts that should have been installed at the factory, the left headlight that would suddenly stop working until I kicked the fusebox, a radio that would only come on when you hit the dashboard in just the right spot (it’s amazing how well frustrated pounding will make things suddenly work on a watercooled VW isn’t it?) and various other odds and ends I’m amazed that it made it to 100,000 miles! Never owned one of these but had at times considered one. I wished I had the guts at the time to simply buy a badly faded light green metallic 2 door I think, ’77 Rabbit that ran that if I recall right was being sold at a small used car lot on Tacoma’s 6th Ave in a former gas station for $7, may have been a typo but hell, it would’ve been fun to give that a whirl. Later on, found a ’79, can’t recall if a 2 door or a 4 door, Westmorland Rabbit in halfway decent shape being sold outside someone’s house, but they wanted $900, but didn’t have the money to buy it and still was a bit chicken to give it a try. This being in the late 80’s, early 90’s or so. My best friend for a short time had a ’77 back in the late 80’s, a base 2 door with the sunroof, which didn’t work (stripped gear) but ran and looked great with the very nice argent steel wheelies and bright yellow paint. I nickkled and dimed him and had issues with the brakes and I think he kept it a year or so. Nice story and I love that baby blue that was once found on cars. Wished it was still being offered today. You saved yourself a whole lotta heartache. 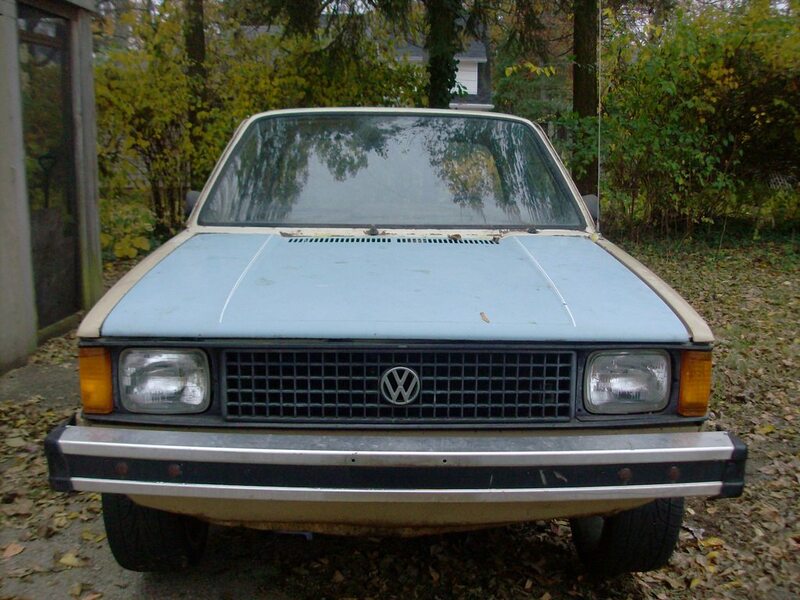 My mother had a 1981 Rabbit…her first and last VW. Right from the start, it nickeled-and-dimed her to penury. I had moved from home, so I didn’t get all the specifics…but problems were severe enough that my folks requested mediation with the company on warranty claims. And – and this really frosted my old man – the factory rep was the same buffoon who, eleven years ago, was the factory rep for Kaiser Jeep…when he had other issues with his lemon Wagoneer. The guy told him to pack sand then, and he repeated the instructions this time, as official Volkswagen directive. That really summed up this car, and VW’s problems in that era in the U.S. A basically good, almost outstanding product…built by desultory employees and management; and sold and serviced by people with the ethics of a grave robber. My own experience fifteen years later with my Westfalia, mirrored that exactly. Bottom line is, no matter how good the car, the support infrastructure has to be in place, and it has to function to the end-user’s best interest. Else the customers will go elsewhere…there’s a lot of stores on the Miracle Mile. Bought a new 74 VW Dasher 4dr, baby blue, 4 speed, in 1975, traded a gorgeous 70 New Yorker 4dr hardtop (the first gas crisis) wish I still had the Chrysler. The Dasher was OK first two years except for gas line freezing all the time in Ohio winters. Learned to always carry cans of dry gas in the trunk. July 3, 1977, the Dasher & I got rear ended in a stopped line of traffic on Rt. 619 east of Hartville, Ohio by a Ford pickup going about 35 mph. Guy was looking at some aluminum siding jobs he had completed on north side of road. Saw him coming but had no where to go. I had cranked wheel to left so on impact my front right fender hit Impala in front of me and left fender hit moving Chevy Pickup traveling past in west lane. Result was two creamed front fenders and headlights, one creamed rear fender, minor damage to the other vehicles. I was not wearing seat belt but only hit windshield with right shoulder and knocked off rear view mirror from windshield. I was late getting home to Kent but I did drive the Dasher home, no problem. I walked in with tie askew holding the rear view mirror saying, “Sorry I’m late honey.” Brought 16 year old nephew down from Michigan to work on Dasher. Used insurance settlement to remodel kitchen and we fixed front fenders with sheet metal and bondo, installing dune buggy headlights on front bumper, stretchy tie down straps to hold hood on car as hinges were broken off. Fixed rear fender with bondo and only new part purchased was one rear taillight assembly. Made a decent commuter car for a couple more years though it was one weird looking car. At one safety check stop in Canton (where I worked at the time), the officer just shook his head and said “This is what we usually call a towaway.” But he couldn’t find any defects. I guess he didn’t know the driver’s door was jammed shut and I normally entered and exited the car through the window. The next Spring I was driving down to the VW dealer in Alliance for an oil change when something happened to the carb and I suddenly had an early case of unintended acceleration. (I figure this might have been an early sign of the later Audi problems). I’m driving along a country road and suddenly the car starts picking up speed quickly. So I simply threw the gear shift in neutral and listened to the engine roar. I was about 2 miles from the dealership at the time so I only put the car in 4th for brief periods to keep it moving and drove in with the engine racing. I shut it off, climbed out the window and told the service manager to use care when driving it into the garage as something was wrong. I don’t recall what was wrong but they fixed it. I will say that the Dasher was a terrific car in snow and that was the best thing about it. In 1979 I gave the car to my wife’s brother in Michigan and he converted it to propane and drove it a couple more years. I know what went wrong with your carburetor! Your Dasher, and mine, had a 2-stage, 2 barrel carb – one primary jet and a secondary for pedal-more-than-half-down applications. The linkage to the secondary broke, leaving it open. When mine did this, I was cruising a steady 65 in a 50 zone, with only light touches to the brake. Unfortunately I had to pass through two towns with traffic lights, then park at the edge of a ferry dock before I could call a mechanic to come get it. This was my first (of two) experiences in my life of SUA, and it wasn’t really difficult. Downshift quickly, plant the brake as I approached the light, then stand on the brake ’til the last minute and shut it off. Light goes green, put the lever in first, turn the key, and upshift quickly. By the time I got to the ferry dock, I had the hang of it pretty well. looks like a diesel snuck in in there along the way, damn rabbits eh? What is the deal with german cars and tail lights not working?! Every Merkur (yes it’s a Ford, but built in Germany) I’ve owned had the same issue.. Having owned the kissing cousin to the Rabbit, Plymouth Horizon with the VW 1.7, I can truly sympathize. I can’t wait for the story on the Audi now. That’s a good question. With the Rabbit it has to do with the window and cowl seals leaking unto the fuse box. Then they changed the fuse box design but not the cowl seals, then they changed the cowl seal design but the fuse box had thin buss bars that overheated. There must have been more to it than that. My Super Beetle had now-you-see-em-now-you-don’t taillights, too…and that car had issues, and was old and leaky, but nothing at the window or the fuse panel. Micheal, was it a diesel? The article doesn’t mention that but the picture sure shows the famous VW clack-wagen. The sound was like Mexican jumping bean/steel ball bearings in in a two pound coffee can. Rabbits and I go way back. My actual intro into the shady-used-car business came from buying Rabbits and fixing them up for resale. Being Rabbits, they broke a lot but they were easy to fix and all the parts were common and interchangeable from one car to the next. I made a lot of beer money on Rabbits and of course I had my dad’s shop to do all the wrenching in. By 1978 the Rabbit was a pretty good car and light years ahead of anything from Detroit. I had many as personal drivers and the L editions had a nice interior and most of the egregious flaws of the 1975-77 cars had been rectified. The 1980 cars were by far the best and I drove a 2 door L five speed diesel with sunroof for quite a while. The Rabbit drove great, light on its feet and peppy,even with the clacker-motor because the cars were so light. The unassisted steering was better than anything I have experienced before or since. The American cars were a classic example of not understanding either your product of customer. The cars were absolutely awful, crappy and cheaped out in the extreme. I remember the gawd-awful “coloured-keyed” mouse-fur interiors with even the steering wheel in baby-blue, truly an abomination. 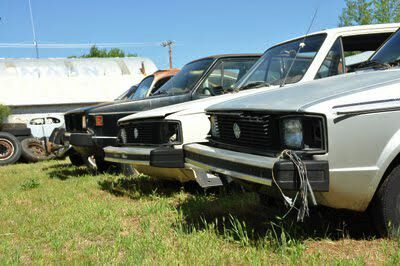 Those cars destroyed VW in North America and they have yet to recover. As for the Westmoreland Rabbits and their horrible interior appointments…I remember a C/D write-up about the then-soon-to-be-opened Volkswagen plant. Seems that in the interest of speed, they’d formed a separate company, Volkswagen Manufacturing USA, Inc. and hired ex-GM executives to set it up and run it. That’s right. Former GM lifers who’d gotten the axe in one of those pruning exercises that were common in the 1970s. And they were given free reign by Wolfsburg…the only guidance was that the car had to be price-competitive in its market. That, after all, was the whole purpose of the American plant. So…was it any wonder that the same tastelessness that permeated GM’s small-car abortions, suddenly started appearing in Americanized Rabbits? Or that quality-control came to be at Vega levels? The Westmoreland effort was a rush job; and what it proved was that their former GM staffers had in fact been fired for good reason. 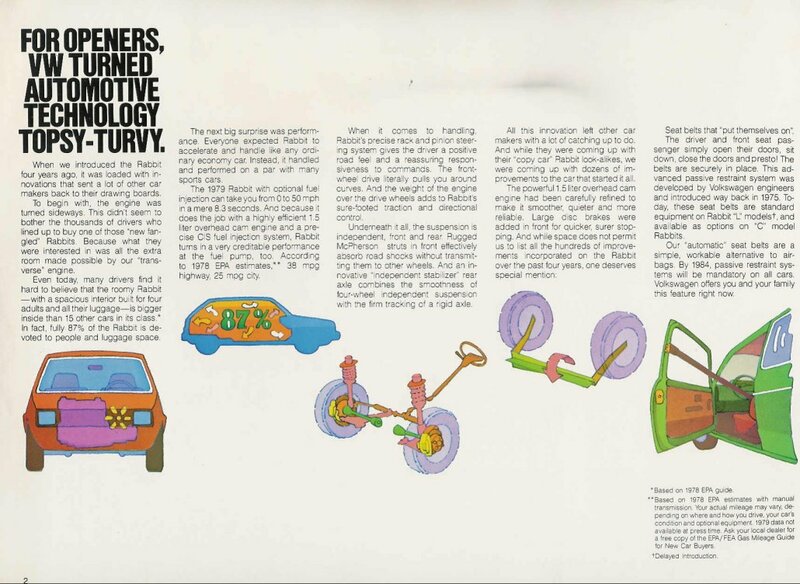 That, sloppy thinking and lack of direction and control…seemed to be the order of the day at Volkswagen in the 1970s and many years following. Sorry, I just grabbed the wrong engine shot. The diesel comes latter. Don’t get me wrong guys, I would still rather have a Rabbit than something from Detroit of that era. It’s just that they were all pretty bad. But my favorite Rabbit years are in the mid seventies when they still had chrome door handles and metal parts. It should be VolkswagEn, not VolkswagOn in the title. Those crappy contacts in the bulb sockets were partially to blame. The moisture in the car would corrode the contacts as well as the relay block. Why did everything have to be relayed? I remember watching Mike strip a whole harness out of a rabbit in my driveway looking for the problem! Ohh, the wasted hours tracing wiring diagrams. I loved and hated the rabbits simultaneously. The diesel was great as long as I kept the block heater plugged in. I wish there was a photo of all the rabbits I had in the driveway. It’s true – rabbits multiply fast. Yes, I forgot about those crappy sockets and leaky light fixtures. That diesel was all my fault too. The white diesel? I can’t remember how I got that one. Oh man, my love/hate relationship with VW. I had a zebra striped VW Thing that I drove around the US. Good stories with that for punk rock kids in 1990 in Louisiana. It wasn’t a friend of their police for sure. Finally got fed up with it and sold it for $1,500. I told the guy I sold it to that if it died on his way home not to call me. I was laughing and said I’d probably pick him up, but luckily he didn’t. A friend had a 67 Bug that we parked in my parents’ huge backyard. We built a ramp, taped a pillow to the steering wheel and would jump it. We’d roll it over onto its side to gawk at the engine every once in a while. Borrowed my sister’s Scirocco for a trip from Sacramento to Olympia. Stupid alternator! Same sister that gave me the Thing after she gave up on it. She offered to give or sell me the Scirocco for cheap but I had none of that and buried myself in deep with a 64 Dart GT with a very nice 318 with dual exhaust. 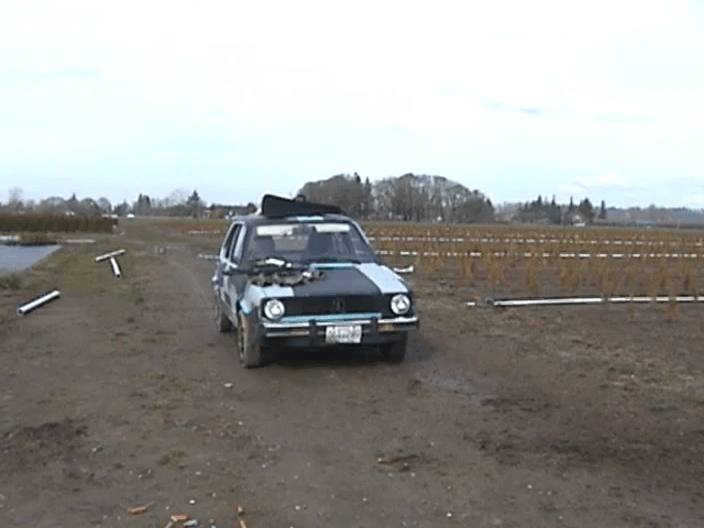 I was a “mechanic” and driver for the VW diesel at the first Lemons. 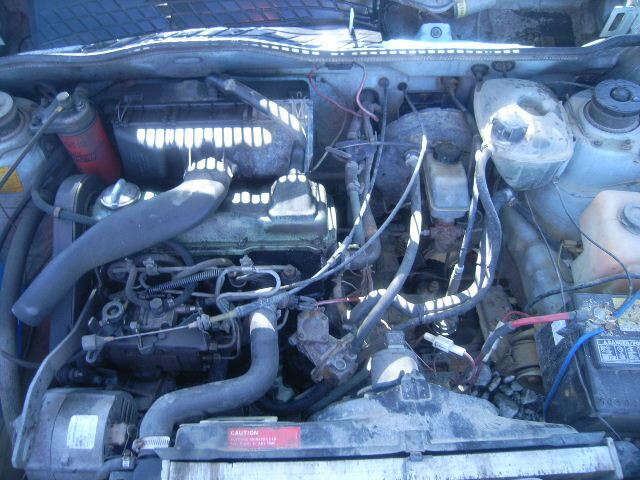 We had no idea why it died after getting a mild thump but later found out that diesels can’t get air into the system. Later I was in the team that raced the first Bug at Lemons (Team Drunken Monkey). It got whacked and we couldn’t keep the driving wheel attached. So two DNFs. Every VW I’ve owned or borrowed was constantly falling apart but somehow still wouldn’t die. I plan on never owning another VW again but sometimes I find myself looking at Things on eBay. My old Corvair (also moneypit) was the first Chevy I’ve owned. I’d like to own another Corvair. And who hasn’t had a vehicle they haven’t shot up? Of course, I just borrowed that F150 that I shot up, but that’s another story. I’ll probably drive my NSU Sport Prinz up to Oregon next spring or summer before hopefully finishing riding round the world on my ’65 Ducati. If I see any of you, I’d love to go out for coffee or drinks. Updated to add a link to the Thing in Louisiana story.